vOneCloud is an OpenNebula distribution optimized to work on existing VMware vCenter deployments. 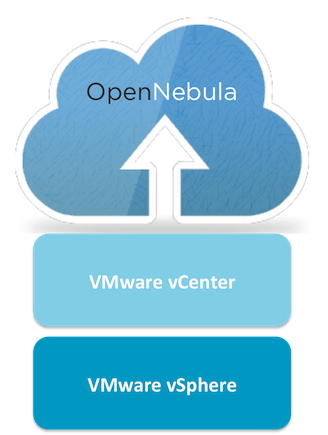 It deploys an enterprise-ready OpenNebula cloud just in a few minutes where the infrastructure is managed by already familiar VMware tools, such as vSphere and vCenter Operations Manager, and the provisioning, elasticity, multi-tenancy, elasticity and multi-vm cloud features are offered by OpenNebula. It inherits all the benefits from the open source cloud management platform, adding an easy to deploy, easy to use aspect due to pre configuration of the OpenNebula install contained within the appliance.